This post isn't about chickens and the recipe doesn't even use eggs, but these little cookies are so good, they're a perfect way to grease the skids, so to speak, if you need help talking your significant other into agreeing to more chickens in the spring. These vanilla shortbread cookies are tiny - only about an inch and a quarter across - which makes them easy to pop into your mouth a few at a time. I frosted them with glaze that I tinted three different shades of pink. They were a big hit with my Valentine last year and I ended up with 6 ducks and 14 more chickens two months later....coincidence ? I think not! Cream the butter with the sugar. Add the vanilla bean paste. Whisk together the baking powder and flour and add gradually, on low speed. Mix until just blended. Form dough into a ball, flatten and wrap in saran wrap. Refrigerate for at least 30 minutes. Preheat oven to 350 degrees. Line baking sheets with parchment. 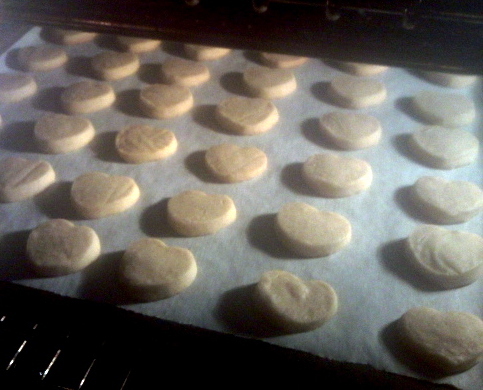 Roll out dough and cut out cookies with mini heart cutter. Arrange on parchment about 1/2" apart. Bake for 10-12 minutes until light brown around the edges. Cool on metal racks. For the icing, whisk together 1-1/4 cup of sifted powdered sugar, 1T milk and 3/4 t. vanilla extract. Tint a third of the glaze with one drop red food coloring, another third with two drops red food coloring and the rest with three drops. Dip twenty cookies into each tinted glaze to cover just the top and let dry completely. Store at room temperature in an airtight container up to a week or freeze extras. 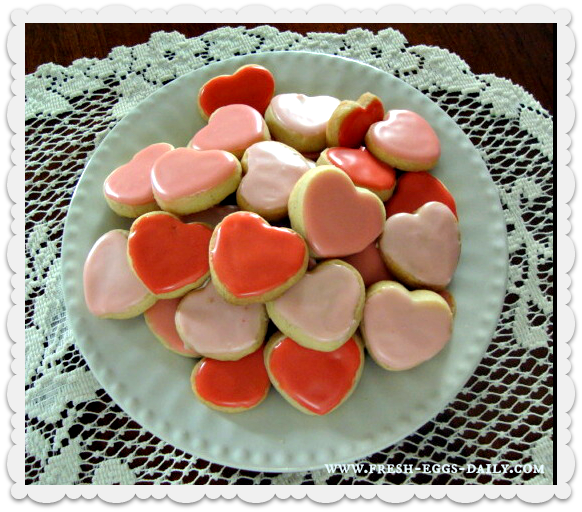 These bite-sized shortbread cookies will be a big hit with your Valentine sweetie. Form dough into a ball, flatten and wrap in saran wrap. Refrigerate for at least 30 minutes. Line baking sheets with parchment. Roll out dough and cut out cookies with mini heart cutter. Arrange on parchment about 1/2" apart. Bake for 10-12 minutes until light brown around the edges. Cool on wire racks. Whisk together the sugar, milk and vanilla. Tint a third of the glaze with one drop red food coloring, another third with two drops red food coloring and the rest with three drops. Whisk each bowl of glaze until uniformly tinted throughout. Dip twenty cookies into each tinted glaze to cover just the top and let dry completely on wire racks. What a great idea. Thanks for the recipe! Oh, wow. I can almost taste 'em. Thanks for the recipe and pretty pix! They are worth trying. Really easy. You can also make round ones using the lip of a shot glass to cut them out. These are adorable! Thanks so much for sharing at Wednesday's Adorned From Above Blog Hop. Cookies this small are so dangerous! They look lovely. I found you on Wednesday Extravaganza. These are so cute! I love shortbread cookies and the icing just makes these better! Thanks for sharing. I love coming to your site - it makes me miss my chickens! Oh they look so so lovely! Like that you use vanilla bean paste (I find it so much better and stronger in taste than extract). Oh these sound and look so yummy! Bit size cookies are not good for me to be around though. LOL! So glad you shared these at my party. I am sharing these on my FB. Can't wait to try these for my son's school party! These are so precious! And shortbread is ever so much tastier than sugar cookies! Shortbread cookies are one of my favorites and these are so cute. Thanks for sharing this recipe with Foodie Friends Friday. Rediculous comment, store for a week.....they won't last a day! In the oven now. Hahah! I have to agree with you there! Enjoy!